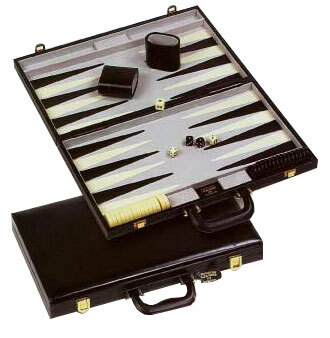 Genuine Backgammon Sets (#2025) - Our Genuine Backgammon Set features a 100% leather exterior with solid brass latches, as well as a high suede playing field. This set includes two coordinated dice cups, backgammon checkers, dice, doubling dice, and an instruction booklet. Measures 18" x 12" (closed). Feel free to browse our selection of other Top-Quality Backgammon Sets, including Leatherette Backgammon Sets and Velour Backgammon Sets.